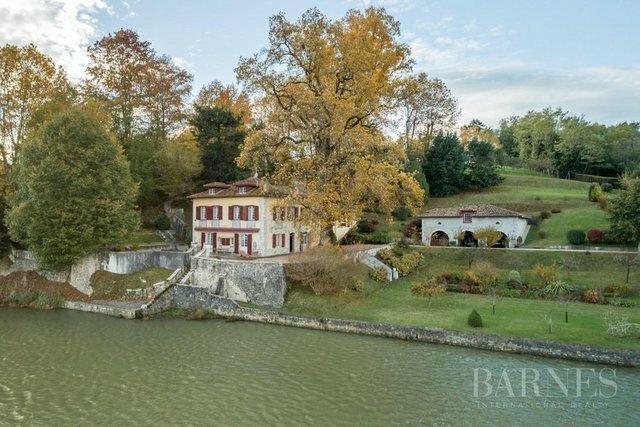 Rare 18th century master house for sale by the Adour river in Bayonne with 450m²of habitable space and in very good condition. This property has a private pontoon and nearly 2.5 acres of land. The accommodation comprises of 2 sitting rooms, dining room, kitchen with pantry,8 bedrooms, 2 bathrooms, 2 shower rooms and 2 offices. Large outbuilding with 3 parking places and a room to be converted. There is a private appartment in the main house with an independant entrance.In the park there are several century year old trees, an orchard, vegetable garden and many varities of flowers and shrubs.5 minutes drive to the center of Bayonne and 10 minutes drive to Biarritz airport.